The brand is also developing headwear for members of Ottawa's police force. 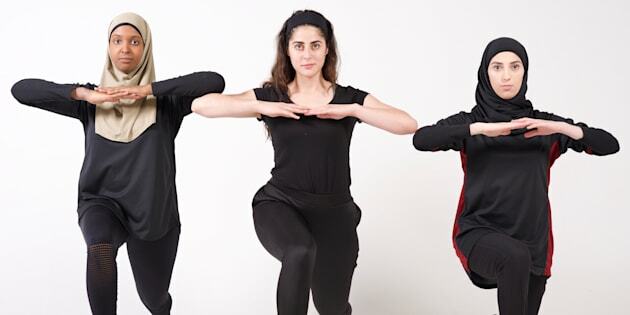 Thawrih co-founder Sarah Abood (centre) lunges with one of her employees and a model. 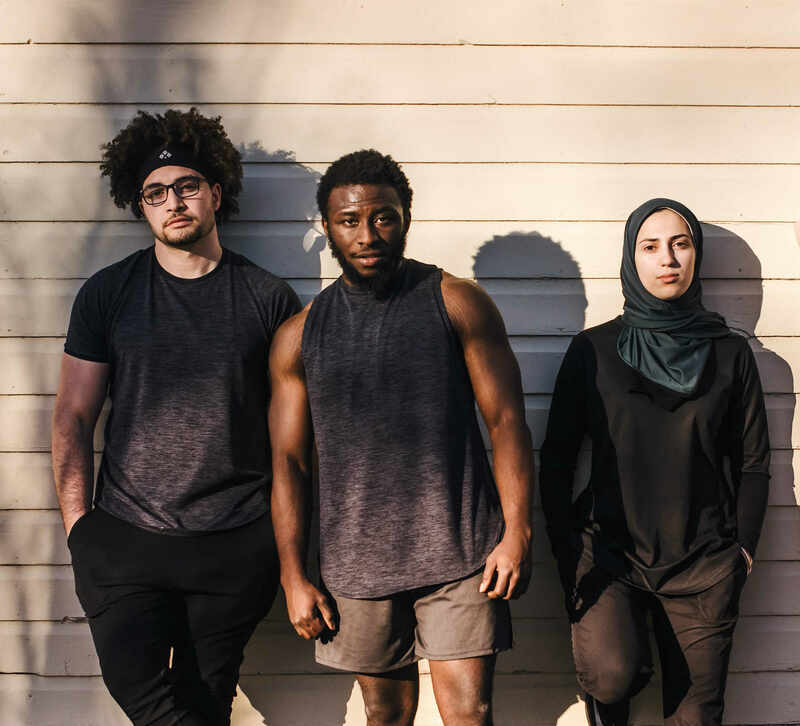 A Canadian clothing company that makes activewear for Sikh and Muslim athletes is breaking down barriers both for the people who buy their gear and the Syrian refugees who make it. Thawrih, founded last year by Sarah Abood, 23, and Sami Dabliz, 22, makes hijabs and turbans with bamboo and quick-dry materials that wick sweat away. Abood said the products also include a built-in headband so they stay in place while performing any physical activity, including swimming. The religious headdress is usually made of either cotton or latex — materials that tend to hold in water and sweat and can potentially slip off easily, said Abood. 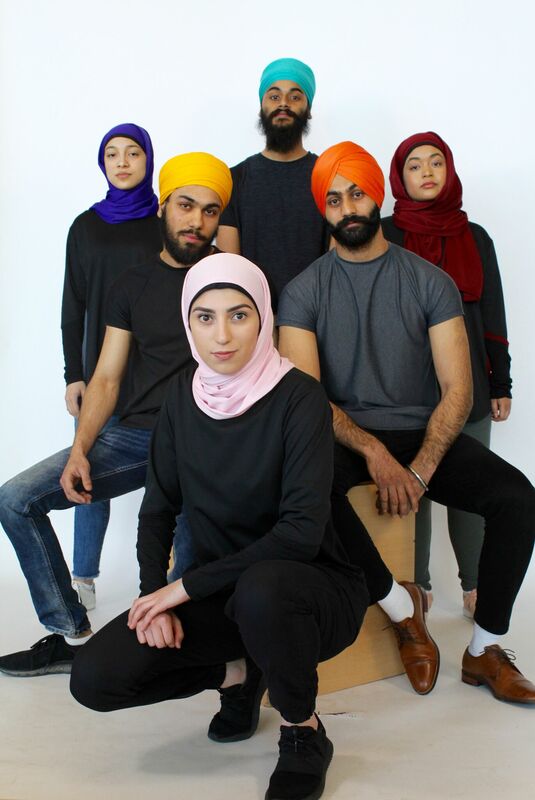 The Ottawa-based company currently sells five different products, including three different styles of sport hijabs, one sports turban that can be customized for multiple lengths and one sports patka, a Sikh head covering worn by children in preference to the larger turban. Thawrih will be releasing two more sports hijab designs using organic bamboo material in the coming weeks and one kids sports patka, said Abood. She added that some Muslim people are uncomfortable showing skin, so they're also coming out with culturally appropriate workout gear in the fall such as modest long-sleeve tops, leggings and swimming leggings, as well as men's clothing. Thawrih team members: Sawsan Abu-Oshaibah (centre in pink hijab), Pavneet Ahluwalia (centre in turquois turban), Shaymaa El-Gayaar (left in purple hijab), Lovepreet Singh Dhillon (right in orange turban). While their materials are sourced from Montreal and all of the products are made locally in Ottawa, Abood told Huff Post Canada that they mainly sell internationally via e-commerce, with 70 per cent of sales coming from international markets, including California, the UK, Germany, the Middle East and Australia. Co-founder Sami Dabliz (pictured on the left in a T-shirt that is set to be released in the fall). The company isn't just a hit with athletes and parents. Abood said that they are testing out a new hijab design for Ottawa Police Service members who wear the religious headscarf, saying the police service reached out to them. One of the barriers to integrating hijabs into the OPS has been a potential choking hazard if any headpiece were grabbed during conflict. The Thawrih prototype is affixed with magnets so it can be easily detached to avoid choking hazards, said Abood. Last year, Police Chief Charles Bordeleau tweeted that he planned to draft a hijab policy for police officers in uniform. While the current stance is that hijabs are allowed, Bordeleau said he wanted the wording in the policy to be more explicit. Abood, who was born in Ottawa to Iraqi parents, said she played high-level soccer and every other sport recreationally, and while she doesn't wear a hijab, many of her friends would come to her for workout advice. Those requests prompted her to become a personal trainer. She said that as personal trainers, clients would often ask her and co-founder, Sami Dabliz,for home workouts because of their religious restrictions or discomfort wearing typical sportswear. "As opposed to helping on a small scale and providing home workouts, we wanted to help on a bigger scale and provide a solution for the problems they were facing," said Abood. "After I had torn my ACL, restricting my athletic ability, I wanted to create a purpose and use my knowledge to benefit others. My partner and I knew the athletic market, so we knew what materials would work best." 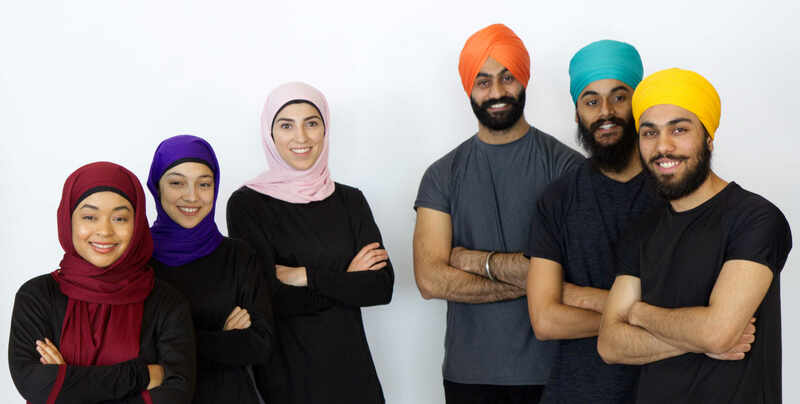 Thawrih's team is made up of members of Sikh and Islamic communities, and the company's clothing is entirely handmade in Ottawa by three Syrian refugees. Abood said they will be hiring seven more Syrian newcomers by the end of August. The company currently employs nine staffers, most of whom are students and recent graduates. In 2015, Abood started a not-for-profit that successfully helped settle publicly sponsored Syrian newcomers to Ottawa, which inspired the desire to hire them. "I learned a lot about their difficulties obtaining employment as they have transportation, language and cultural barriers," said Abood. "As their (government-assisted) benefits are temporary, with no foreseeable employment in sight, I knew that this would take a toll on the Canadian economy." Re-introducing The "Your Revolution" Sports Hijab! The first of three hijabs with the primary motive to provide style while providing comfort throughout any activity👟🧕🏼🙌🏽🇨🇦 MADE IN CANADA BY SYRIAN NEWCOMERS 🇨🇦🙌🏽 The Thawrih Women's Sports Hijab combines ventilation with sweat-wicking fabric to help keep you cool, dry and comfortable. Our Quick-Dry material is perfect for sport, the gym, 🌊SWIMMING🙌🏽, and any physical activity. Built in headband to ensure hair and workout hijab stays in place. Quick-Dry Technology helps keep you dry and comfortable Infinity wrap ensures a stylish finish with customizable neck coverage. Engineered to give you a breathable, irritation and distraction free workout. As a recently graduated economics student, Abood understood the degree to which this could become a social and economic problem. So, she decided to hire them. "Every purchase empowers a newcomer by providing them with confidence and helping them overcome job-related obstacles they many face," says the Thawrih website. "This initiative enables newcomers to enter the labor force, provide for their families, and also aids with the integration process of their families into local communities." As Thawrih grows, its production model is one Abood would like to see expanded globally. With the help of a regional coordinator on the ground, she said Thawrih could have newcomers in places such as Germany making hijabs and turbans for German customer orders. Abood said they are working on processes that will enable them to hire newcomers across the world and have products made locally in various places by newcomers. Sarbjit Kaur, a Sikh mother of two teenage girls, who lives west of Toronto, said she wished these products existed when she was growing up. "This company clearly understand there's a need and market for this type of sportswear," said Kaur. "The fact that the items are made in Canada by newcomers is another fantastic angle that shows its not just about selling to a niche market and making money. There's a bigger idea of promoting community and social cohesion here." Kaur said that her brothers used to play baseball when they were kids, wearing mini turbans (gutti). She recalls one day when a baseball ball hit her brother in the head and his gutti came undone. "I could tell he was embarrassed. The coach, teammates and all the people watching (including myself) were waiting in awkward silence while he tied his top-knot back up," said the mother of two children. "For kids especially, a product like this can make them feel more comfortable and confident so they don't have to worry about things like that and can just focus on participating and performance."